Collector Brenda McCrary sent me a set of pictures of a child in a long white gown, seated and holding a tambourine (pictured below right). Note the Tang sticker on the front of the item. Collectors who are very familiar with older items in the NAO brand would have a strong sense of dejá vu in looking at this item, which appears to be none other than NAO's "Angel with Tambourine" (NAO model #11), only without the wings! 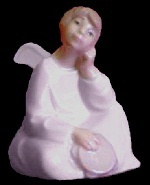 It seems clear that the same sculptor was responsible for this child with tambourine, with or without the wings. This and other examples of inter-brand cross-fertilization in Lladró raise a number of "which-came-first-the-chicken-or-the-egg" questions about the direction of the influence. In this case, were Tang artisans copying early NAO models? 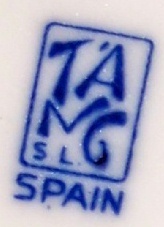 Or was Tang the originating brand for the model - in which case Tang would have to have been pretty old indeed, since production evidence suggests that NAO has been around about as long as Lladró's regular collection? Or were Lladró sculptors working in both NAO and Tang at once? 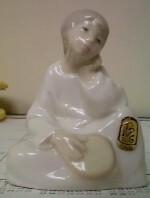 Left, back view of Tang child with tambourine - no wings. 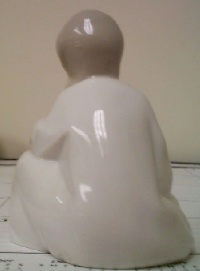 Deepening the mystery, collector Jim Algeo shared with me the photos of figure and base of a genuine Tang figurine of a boy with lambs (pictured below) that looks very like the regular collection Lladró model #4509, "Boy with Lambs" but whose minor differences prevent us from concluding that it is a clone/identical twin. (Differences include the posture of the boy's legs and the position of the lambs.) It's a lovely model and, as it so happens, has a Tang mark in a cobalt blue backstamp! (This is unusual because Lladró has seemed, in all other cases, to have reserved the cobalt mark color to items from its regular collection.) 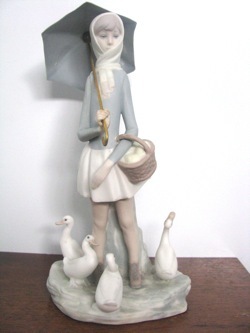 The modeling of the lambs is particularly delicate, and the legs on the standing lamb are an example of the kind of modeling risk almost never found in non-Lladró brands - both because most companies lack the skill and because production costs are higher for items with separately articulated limbs. 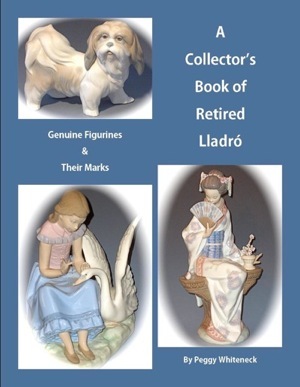 Lladró customer service staff in Spain, in response to continuing collector questions, have lately agreed that some of the most famous core collection sculptors also created several (perhaps all?) of the early NAO models. So it's not all that surprising to see these kinds of affinities between Tang and NAO as well. 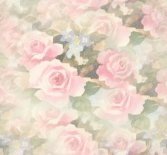 So what does that all mean for collectors? Well, speaking strictly for myself, I don't care what brand label they slap on it (Lladró, Tang, NAO, Rosal, Zaphir...): With apologies to Gertrude Stein, a Lladró is a Lladró is a Lladró.